Model P44 is the Feinwerkbau high-quality compressed air pistol with exposed barrel. Besides elegant design the air pistol is equipped with high-quality technique and best finish. The recoil impulse is nearly eliminated due to the integrated absorber. The recoil impulse is compensated via a tungsten alloy piston working in the direction of the barrel. Barrel ports and the Feinwerkbau separator on the front-end of the barrel additionally improve the shooting behaviour. The sighting of this air pistol can be varied in length and a shifting from -15° to +15° is possible. The three-dimensional-grip is available in five different sizes as right- and left-handed version. The grip can be rotated horizontally as well as vertically. The trigger point is fine adjustable. The trigger slack weight is adjustable from 220 to 500 grams. The trigger point weight is adjustable between 80 and 300 grams. The air pistol is completed through the trigger shoe which can be rotated and swivelled. Furthermore it can be tilted via a ball and is therefore adjustable threedimensionally. 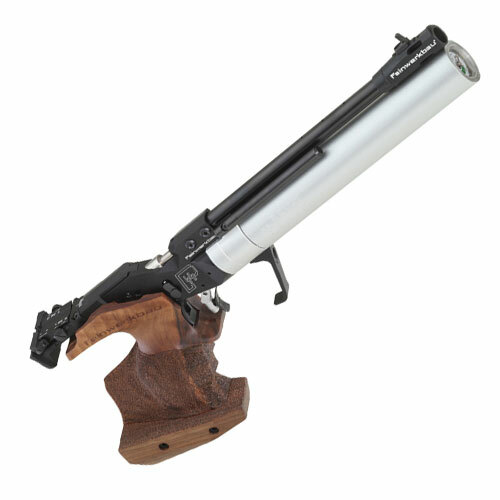 So the shooter has the entire control before shooting – and this with a total weight of only 950 grams. Be inspired of the innovative functioning of the trigger components and the high-quality finish of this air pistol. The P44 is delivered in a special transport case including a compressed-air cylinder with integrated manometer.